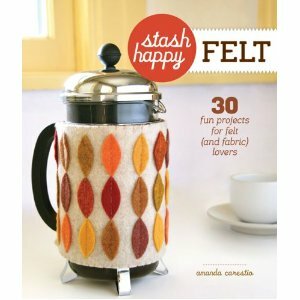 Back when I was happily leafing through Stash Happy Felt by Amanda Carestia in order to review it, I came across an idea that made me start thinking. Yup, just simple felt flowers. But I had to add some spins and twists to the project presented in the book until it became truly mine. There's nothing wrong with Amanda's directions...I just wanted to do them differently. 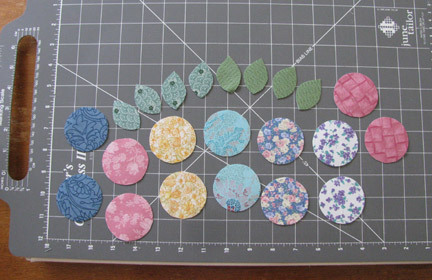 The biggest change I made was to substitute cotton fabric backed with interfacing for the center of each flower. Another change was adding leaves to the stems. I also added a layer of sticky-backed felt to the back of each flower to give it extra stiffness (large flowers will tend to flop, even with several layers of felt). 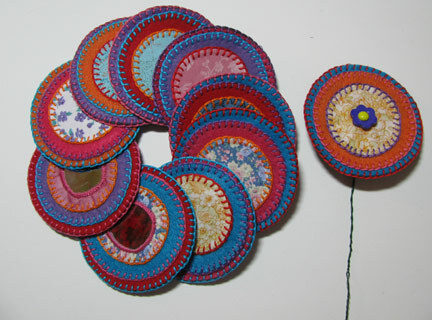 And last, I added some circular mirrored pieces to a few centers, stitching them on with shisha-style embroidery. This meant having to attach the stems differently too, but it worked out well. 1. 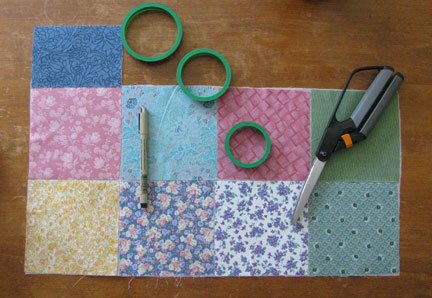 Iron cotton fabric to shirtweight interfacing. 2. 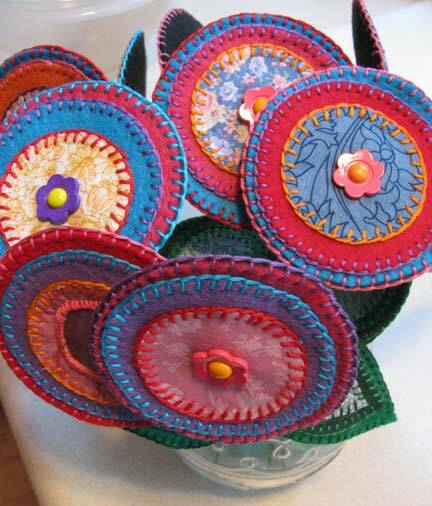 Trace the smallest flower shape on the interfacing side and cut out the flower centers. 3. Do the same for the leaves. 4. 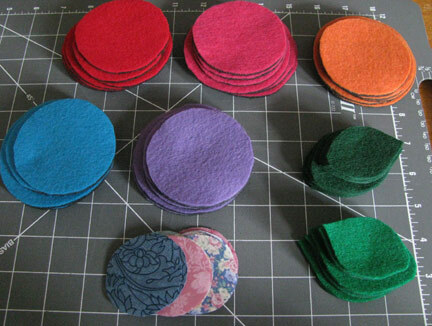 Cut the medium and large shapes from felt. 5. 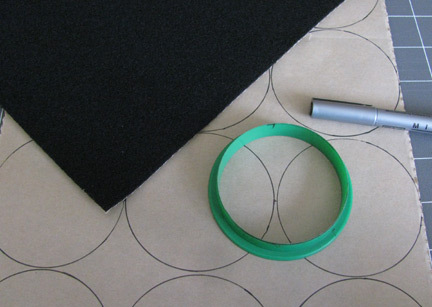 Cut the largest flower shape from sticky-backed felt too. 6. 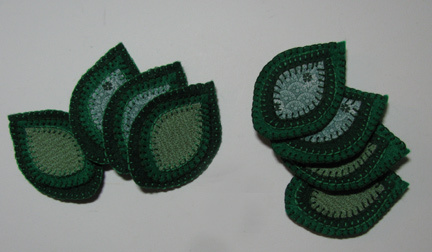 Stitch all the flower shapes together, starting with the smallest. Stitch around the outside of the largest shape, backed by the sticky felt. 7. 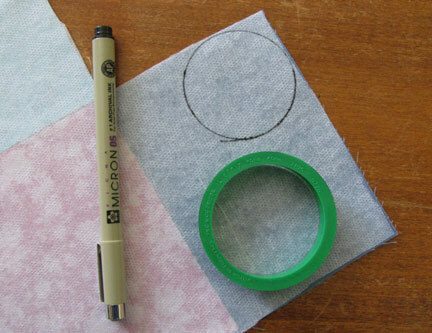 Do the same for the leaves, but they probably won't need a sticky felt layer unless they are very large. 8. 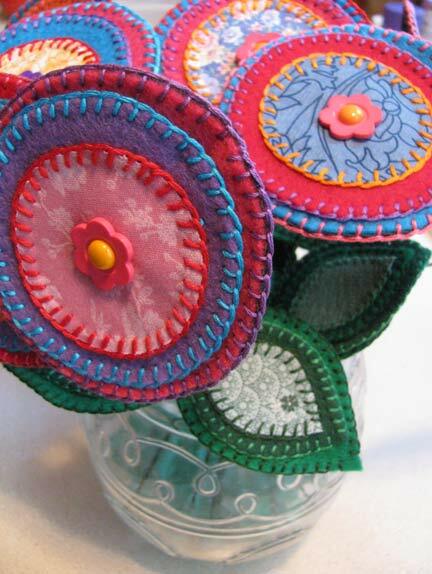 Add the stems to the flowers by making a small slit in the middle of the flower. Bend a piece of floral stem wire through a shank button and insert both ends through the slit from the top. Underneath, thread the wires through the holes of a regular button and twist them together. When you get to the place you want to add a leaf, poke one wire through the leaf near the bottom and continue twisting the wires together. Those are darling, Cyndi. Thanks for the ideas. They'd be cute on a tote back too, though with a more 2D look. Did you deliberately choose the color scheme to match your blog background?